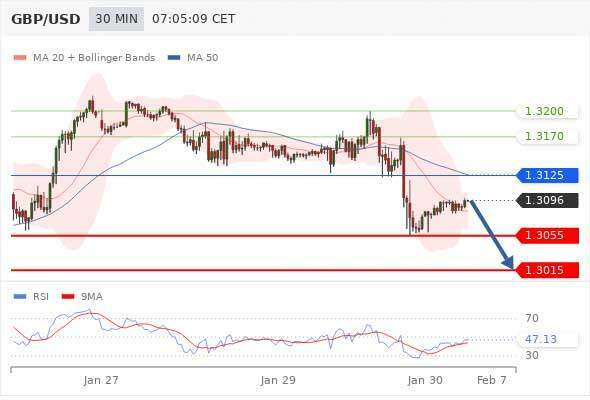 Daily Technical Analysis, Market Analysis and Forex tips 30th January 2019 of Euro, US dollar, British pound, Swiss franc, Japanese yen, Canadian dollar and Australian dollar. Our preference is for long positions above 1.1415 with targets at 1.1450 & 1.1480 in extension. Alternative scenario is below 1.1415 look for further downside with 1.1390 & 1.1370 as targets. Our preference is for short positions below 1.3120 with targets at 1.3055 & 1.3015 in extension. Alternative scenario is above 1.3120 look for further upside with 1.3170 & 1.3200 as targets. Our preference is for long positions above 0.9935 with targets at 0.9960 & 0.9975 in extension. Alternative scenario is below 0.9935 look for further downside with 0.9920 & 0.9900 as targets. Our preference is for long positions above 109.25 with targets at 109.55 & 109.70 in extension. Alternative scenario is below 109.25 look for further downside with 109.10 & 108.90 as targets. Our preference is for long positions above 1.3240 with targets at 1.3285 & 1.3305 in extension. Alternative scenario is below 1.3240 look for further downside with 1.3215 & 1.3200 as targets. Our preference is for long positions above 0.7160 with targets at 0.7205 & 0.7235 in extension. Alternative scenario is below 0.7160 look for further downside with 0.7140 & 0.7120 as targets.